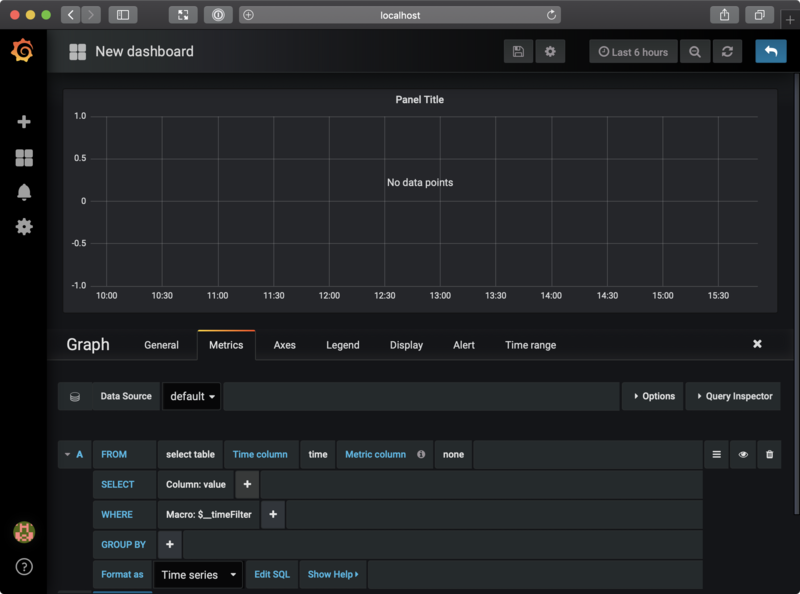 Grafana is an open platform for time series data visualization and monitoring that works well for time series analytics. 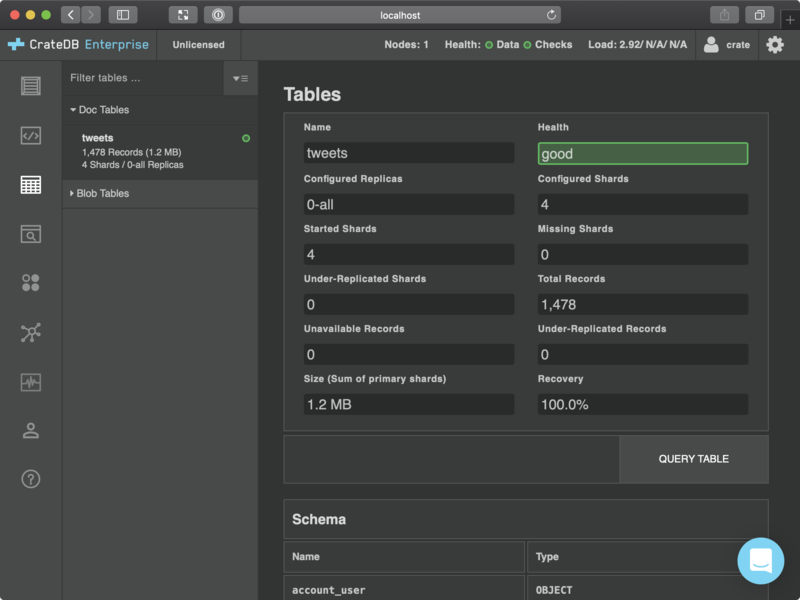 CrateDB is a distributed SQL database that makes it simple to store and analyze massive amounts of machine data in real-time. 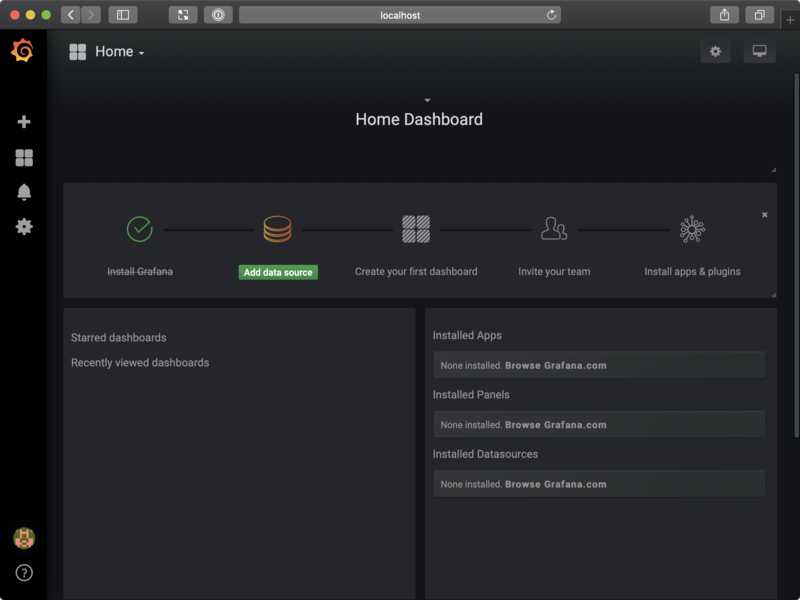 In this post, I will show you how to get started with CrateDB and Grafana on macOS, but these instructions should be trivially adaptable for Linux or Windows. If you don't already have CrateDB running locally, it's relatively effortless to get set up. $ bash -c "$(curl -L https://try.crate.io/)"
This command just downloads CrateDB and runs it from the tarball. If you'd like to actually install CrateDB a bit more permanently, or you are using Windows, check out our collection of super easy one-step install guides. If you're using the command above, it should pop open the CrateDB admin UI for you automatically once it has finished. Otherwise, head over to http://localhost:4200/ in your browser. If you’re playing around with a fresh CrateDB install, it's likely that you don't have any data. So head on over to the Help screen by selecting the question mark icon on the left-hand navigation menu. Select IMPORT TWEETS FOR TESTING and follow the instructions to authenticate your Twitter account. Don't worry. This isn’t going to post anything on your behalf. It doesn’t even look at your tweets. All this does is import a bunch of recent public tweets on Twitter. 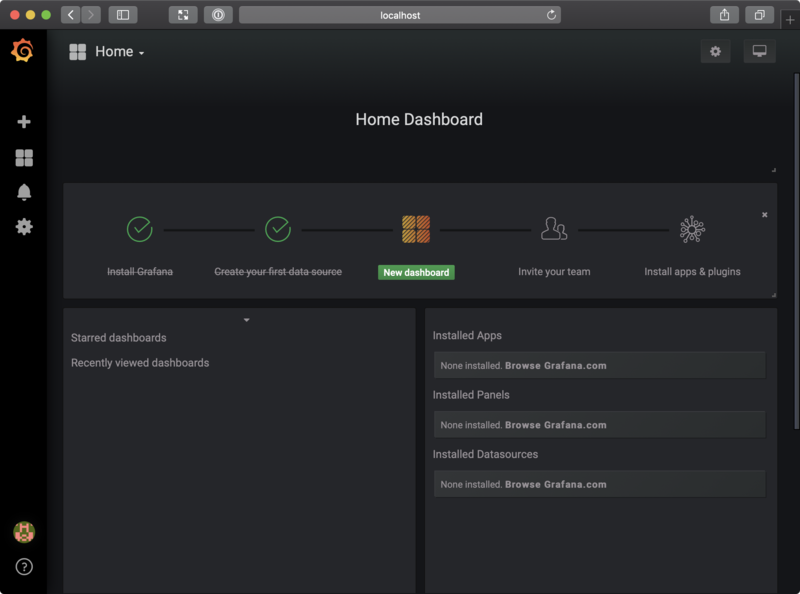 Head on over to the Grafana download page. Select the operating system you're using and follow the instructions. remote: Enumerating objects: 14, done. remote: Counting objects: 100% (14/14), done. remote: Compressing objects: 100% (10/10), done. Unpacking objects: 100% (14/14), done. Tapped 1 command (43 files, 55.3KB). 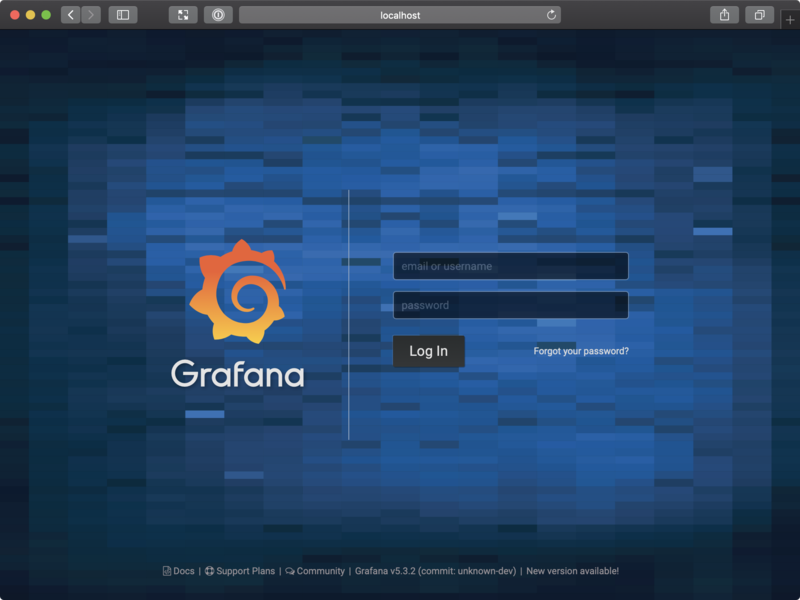 Now, you can access the Grafana interface by visiting http://localhost:3000/ in your browser. The default username admin and the default password is admin. Enter those on this screen. After doing so, you will be prompted to change your password. 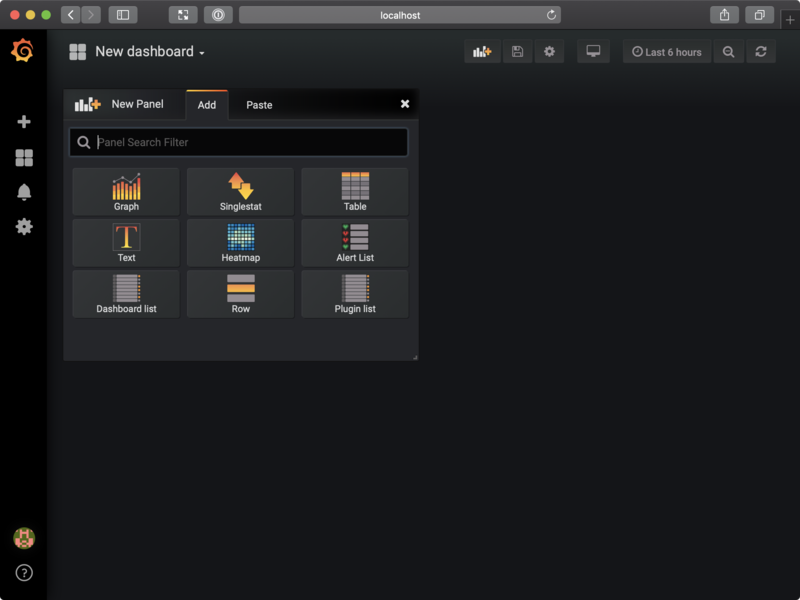 From the Grafana home dashboard, select Add data source. 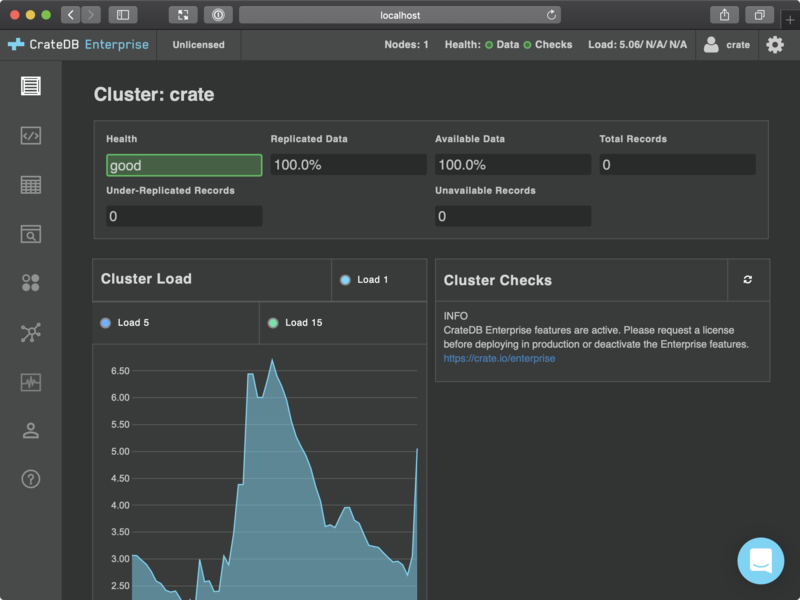 Name the data source "CrateDB"
Go back to your Grafana home dashboard. We have some imported tweets. So let's work with that and graph the number of imported tweets over time. 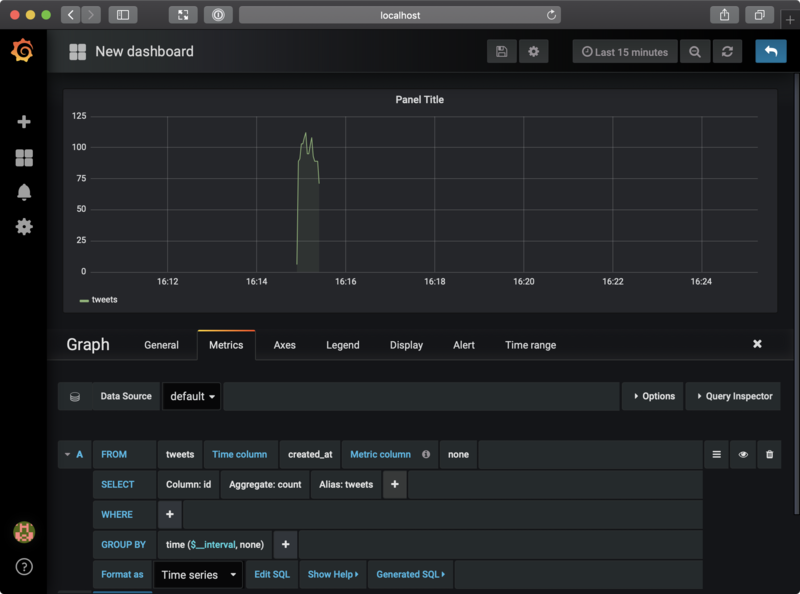 Grafana dashboards are composed of building blocks called panels. Let's add a panel to graph our tweet import data. Select Graph from the New Panel widget (shown in the screenshot above). I know this seems like something went wrong, but there's no need to fret! We just need to configure the panel. Click the panel title ("Panel Title" in the screenshot above) to get a drop-down menu, and from that menu, select Edit. As you configure this, Grafana will set GROUP BY to time ($__interval, none). This is correct, so you can just leave it in place. 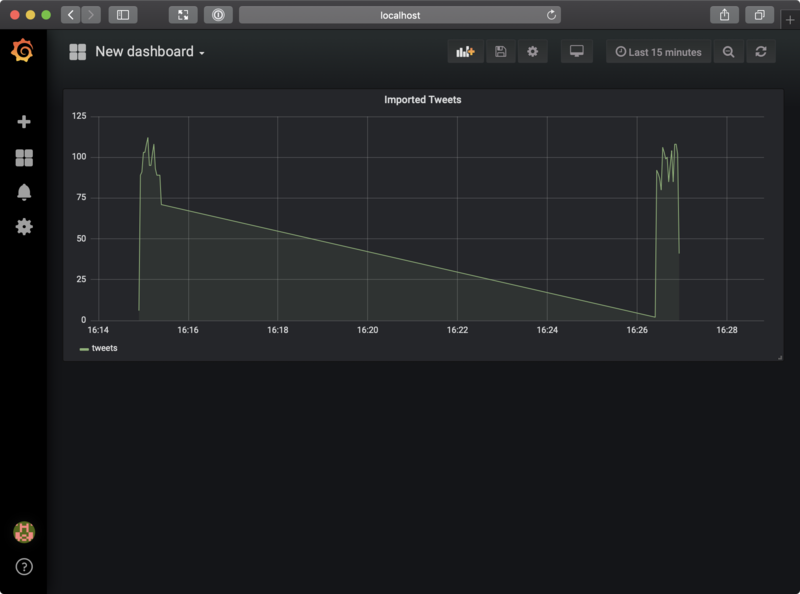 With this setup, we're instructing Grafana to plot a data point for each time window named tweets that corresponds to COUNT(id). That is, we want Grafana to plot the total number of unique tweets per time window (seconds, hours, etc.). The size of the time window can be adjusted in a later step. The graph should update automatically. But there's a good chance your graph doesn't show much. That's because the default time period is six hours, and we only imported a small batch of tweets. So, change the time period in the top right-hand menu from "Last 6 hours" to "Last 15 minutes", or whatever you prefer. 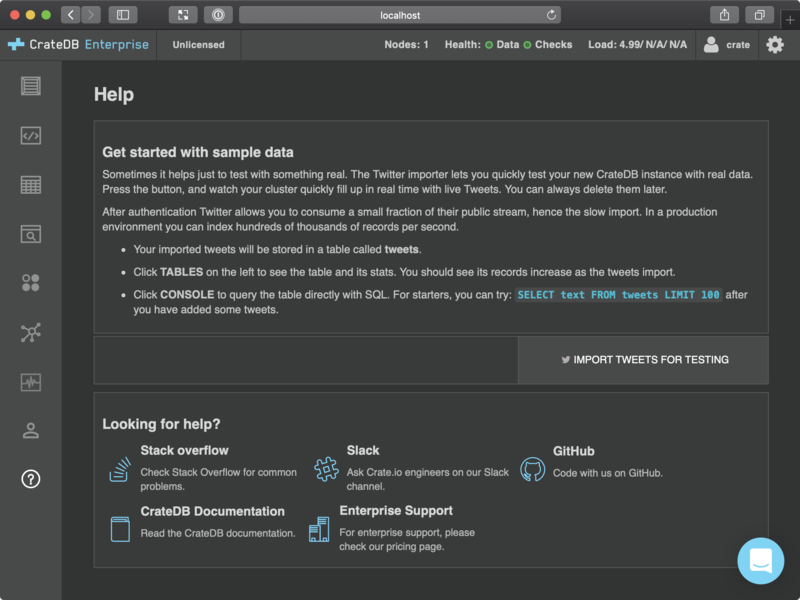 If you go back to the CrateDB admin UI help screen, you can select IMPORT TWEETS FOR TESTING again. 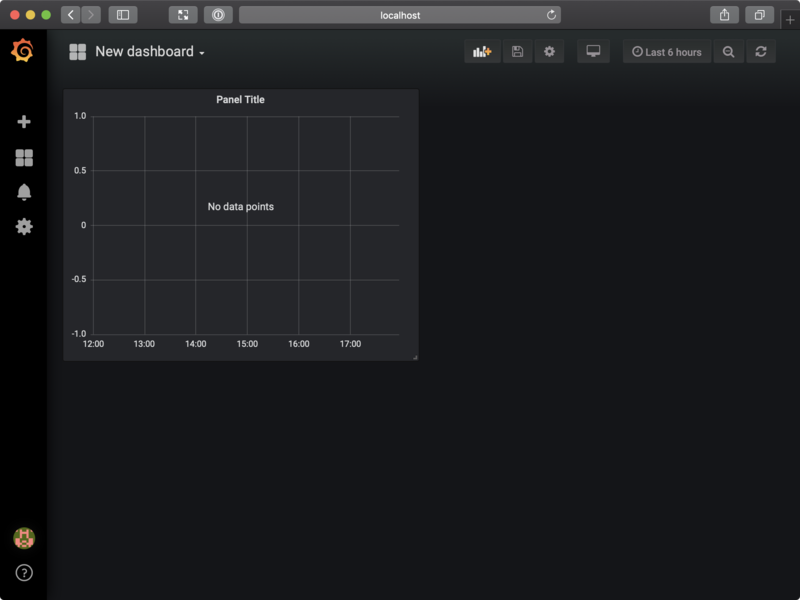 Now, you can refresh your Grafana dashboard (using the refresh icon at the top) or change the time period (which will also refresh the data). From here, you can select the General tab at the bottom of the graph, and rename the panel to something like "Imported Tweets". When you're done, select the blue arrow icon at the top right and return to your dashboard. Naturally, if this was a production app, it is likely that we would have a continuous stream of data to graph. One last thing. Make sure to select the floppy disk icon at the top of the screen to save your dashboard, choosing an appropriate name. From here, you might want to continue with either the Grafana documentation or the CrateDB documentation. 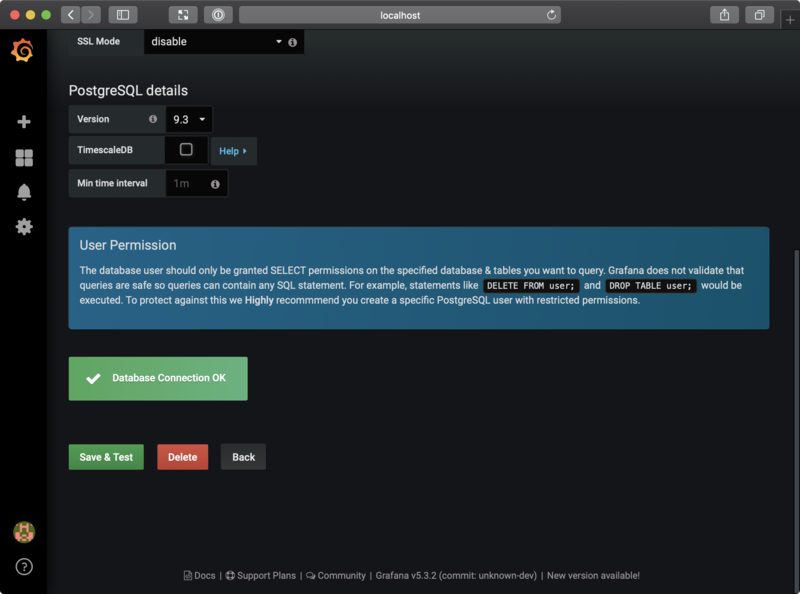 In this post, I showed you how to get CrateDB and Grafana up-and-running on your local machine. We imported some tweets and then visualized the import process by graphing the number of imported tweets over time. 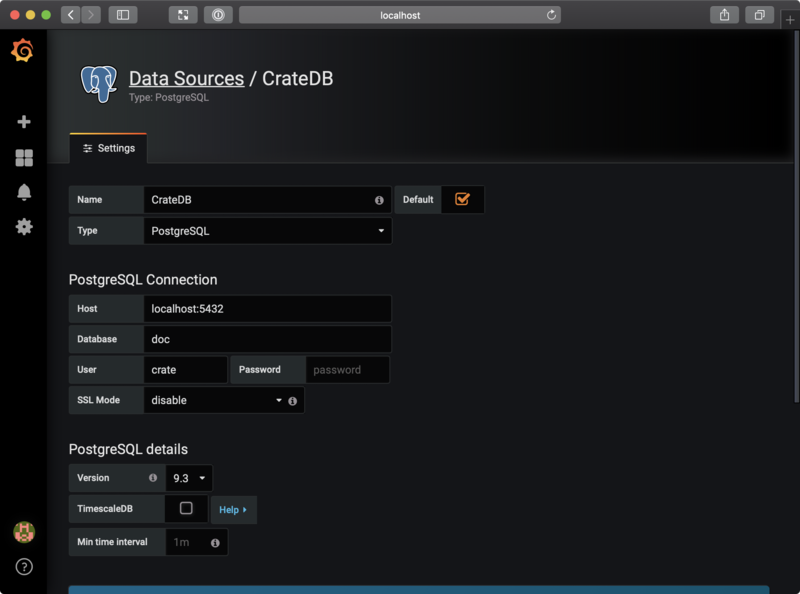 This is the probably most simple demo of what CrateDB and Grafana can do together. Hopefully, however, it was enough to get you thinking about the possibilities for real-world applications. 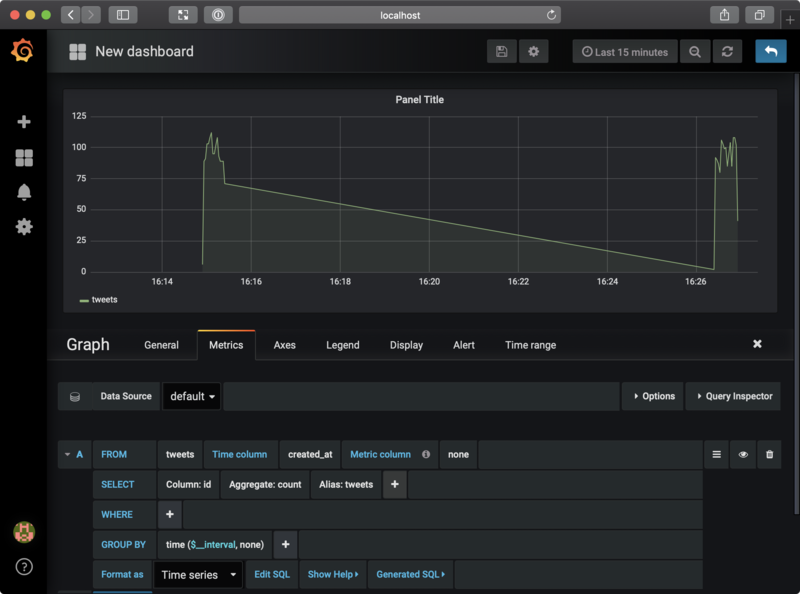 Grafana is an excellent tool for data visualization and a perfect fit for the sorts of time series and machine data use-cases CrateDB was built for.